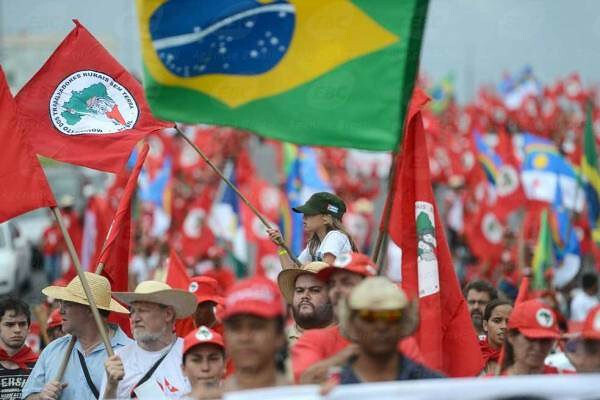 Landless workers set off on historic march: "The people will encircle Brasília"
Approximately 5,000 peasants from all over Brazil will take part in the National Free Lula March organized by the Landless Workers’ Movement (MST) and La Via Campesina (LVC), an international peasant’s movement. The demonstration will take place in August 10th through 15th and will end in Brasília, capital of Brazil. In addition to fighting against the prison of ex-president Luiz Inácio Lula da Silva, who is being held in Curitiba for more than 100 days, workers will march to draw Brazilians’ attention to the severe economic and political crisis the country is currently facing. The marchers will walk 50 kilometers (more than 30 miles) in four days, in three different columns: one group will set off from the city of Formosa, Goiás, one from Luziânia, Goiás, and one from Engenho das Lages, Federal District. All columns will arrive in Brasília simultaneously and each will have around 1,500 landless workers marching. Members of the MST from all 23 states where the movement is organized will take part in the march. Protesters will gather on August 10th in each of the three starting points and the opening rally will join the National Day of Demonstrations and Protests of Labor Union Federations. The march will effectively start Saturday, and the three columns should arrive in Brasília on August 14th. On the following day, a massive pro-Lula demonstration will be staged in the capital city of Brazil, as it is the deadline to register candidates with the electoral court, and when the former president will be registered to run in the upcoming elections, in October. In every city the march stops, activists will plan a schedule with dialogue circles, political education activities, plays, and agitprop interventions. The idea is to promote the interaction between workers who are taking part in the demonstration and locals, expanding the debate about democracy and the problems the country is facing. “The march aims to register Lula as a candidate and demand the Supreme Court releases the ex-president, as he is unfairly imprisoned. Of course, the march will also denounce all the structure of the  coup, which is corrupt, authoritarian, against our democracy, and was pushed by the judicial system, the media… The idea is to start a conversation with the people, who actually massively support Lula and, therefore, have the conditions to win the elections in the first round. For this reason, it is crucial that Lula can run in the elections,” Gilmar Mauro, from the national board of the MST, told Brasil de Fato Radio on Thursday. Organizing a large number of people in such a huge demonstration can be challenging. But the movement has long experience in this sense. “Our 2005 march had 12,000 people. There was food for everyone and we had no incidents, absolutely no problems, for us and society at large. And this time it will be the same,” Mauro said. The national march staged by the landless workers in 2005, the MST leader recalls, set off from the city of Goiânia, Goiás, and for two weeks peasants walked almost 200 kilometers (nearly 125 miles) to Brasília. In 1997, around 1,300 landless workers held, in Eldorado dos Carajás, the National March for Employment, Justice, and Agrarian Reform. That march aimed to arrive in Brasília on April 17th, exactly one year after the Eldorado dos Carajás Massacre – when 21 peasants and members of the MST were murdered by Pará state military police officers. The marchers set off from three different locations on February 17th, 1997, and walked for two months through several cities of Brazil. 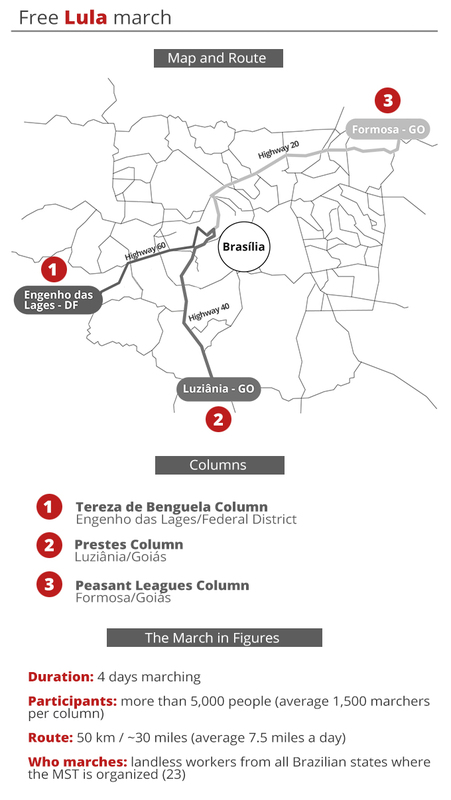 That year, one of the columns set off from the city of São Paulo with 600 people; one from Governador Valadares, Minas Gerais, with 400 members; and one from Rondonópolis, Minas Gerais, with 300 marchers. Each column walked around 1,000 kilometers (more than 600 miles).